Worldwide, 47 million people are living with Alzheimer’s and other forms of dementia. No matter how common it may be, Alzheimer’s is not a normal part of aging. 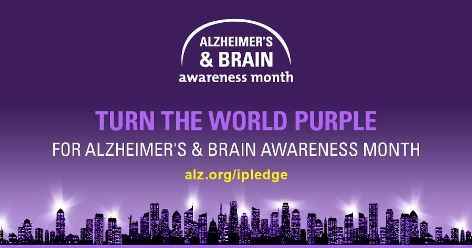 June is Alzheimer’s and Brain Awareness Month. Here are some important things everyone should know about Alzheimer’s and dementia. Alzheimer’s is a disease that attacks the brain. It is defined by progressive mental deterioration that can occur in middle or old age due to generalized degeneration of the brain. It is the most common form of dementia. Because it is a progressive disease, symptoms gradually worsen over the years. In its early stages, memory loss is mild, but late-stage Alzheimer’s can affect an individual’s ability to communicate and respond to his or her environment. Who is affected by Alzheimer’s? Alzheimer’s disease affects an estimated 5.5 million Americans of all ages. By 2050, this number could rise as high as 16 million. Every 66 seconds, someone in the U.S. develops Alzheimer’s. Of those living with Alzheimer’s disease, 5.3 million are age 65 and older. About one in 10 people age 65 and older has Alzheimer’s. Almost two-thirds of Americans with Alzheimer’s are women. Read more about the signs and symptoms of dementia here. If you or your loved one is experiencing any of these symptoms, don’t ignore them. Schedule an appointment with your doctor. Who cares for people living with Alzheimer’s? While there are care facilities like The Cottages available to provide long-term and respite care to those living with Alzheimer’s and dementia, many Americans living with dementia are cared for by loved ones. More than 15 million people provide unpaid care for people living with dementia and approximately two-thirds of these caregivers are women. In 2016, these caregivers provided an estimated 18.2 billion hours of care valued at over $230 billion. Caring for someone with Alzheimer’s or dementia takes a toll on those caregivers, making caregiver support, resources and respite care essential. Unlike Alzheimer’s, dementia is not a specific disease, Rather, dementia is a general term used to describe any mental decline that is severe enough to interfere with one’s daily life. Dementia can be marked by memory disorders, personality changes and impaired reasoning. Any diagnosis of dementia or Alzheimer’s can be unsettling, both for the one living with dementia, and his or her loved ones. If you have received this diagnosis for yourself, or your loved one, do not lose hope. There is support for people living with Alzheimer’s and their caregivers. The Cottages Senior Living provides both long-term and respite care for people living with Alzheimer’s as well as family support for loved ones of those living with dementia. Contact us today to learn how we can help you and your loved one.